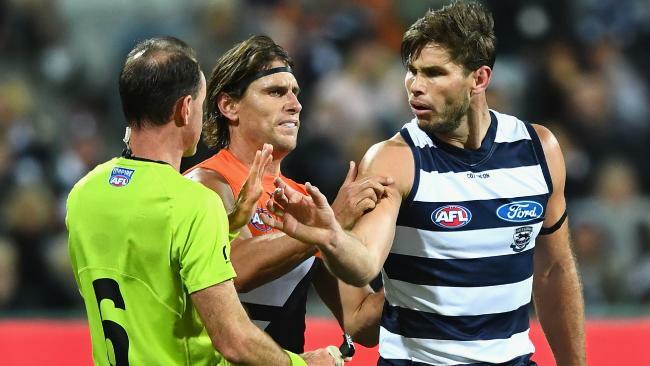 GEELONG star Tom Hawkins has been referred straight to the tribunal for making contact with umpire Dean Margetts during Friday night's win over GWS. Match review officer Michael Christian reviewed the game on Sunday and ruled Hawkins made intentional contact with the umpire as he pushed Margetts' arm away. As it has been ruled as intentional, it is a direct referral to the tribunal with no early plea available. The ruling followed Hawkins' declaration after the match that he did not mean to touch the umpire and had initially thought he was pushing away an opponent's arm. Hawkins, who was suspended twice last year for striking, said the incident occurred in the heat of the moment. "In the contest I was obviously late to the ball, paid the free kick and 50m against me," Hawkins said. "I thought initially it was an opposition's hand, so didn't mean to make any contact with him. "I apologised to him after. It was obviously accidental." When Tigers great Matthew Richardson said it "looked like a reflex action", Hawkins agreed. "Yeah," he told Channel 7. "That's what happens in footy. Heat of the moment." Margetts took immediate action against Hawkins after the incident, saying to the Cat: "Hey, don't touch me." The incident occurred after a late spoiling attempt from Hawkins as he kneed GWS defender Nick Haynes and collected him high with an errant fist as he arrived late to a marking contest. The Cats star has also been offered a $2000 fine for that incident. Earlier on Sunday, Geelong coach Chris Scott said that while he believed Hawkins didn't mean to touch the umpire, he wouldn't be opposed to the charge being heard at the tribunal. Margetts had the power to report Hawkins on the spot - which he didn't do - and Scott said that decision spoke "a little bit to the way he interpreted the situation". "I thought Tom's explanation was pretty good ... I'm clearly biased, but I do have the advantage of knowing Tom really well," Scott said. "He's an honest guy and I think he called it exactly as he saw it. 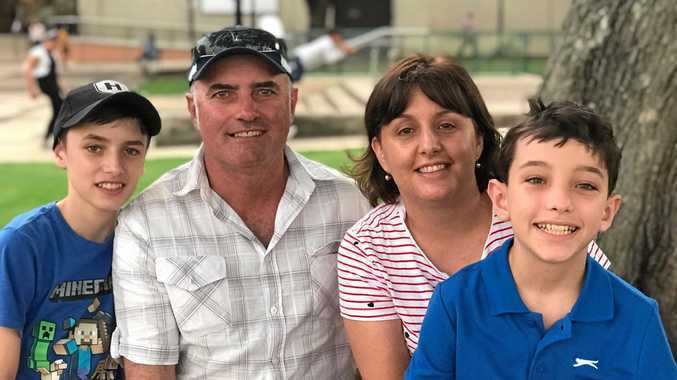 "I imagine the process with (match review officer) Michael Christian will be that he'll speak to the umpire and get his view and speak to a number of people. If there's any doubt, they'll probably put it up (to the tribunal) for clarification." Tom Hawkins has been offered a $2000 fine for kneeing in a late spoiling attempt. Scott said sending cases directly to the tribunal could be a good thing. "It's not a bad process sometimes just to put it up - not even put a case forward to say 'We definitely think this requires suspension' but just to say 'Maybe it requires a little bit more investigation'," he said on SEN.
"Contact with umpires is a serious matter and we shouldn't be flippant about it, but not withstanding what some people would interpret from the vision, I trust Tom implicitly and if he says he didn't deliberately do it, I believe him." In 1997, Carlton great Greg Williams was suspended for nine weeks for pushing field umpire Andrew Coates, and Heath Shaw was banned for a week in 2009 after making intentional contact with an umpire. Last weekend, five players were fined $1000 for making contact with an umpire, including reigning Brownlow Medallist Dustin Martin.